Aldehyde oxidase (AOX) is characterized by a broad substrate specificity, oxidizing aromatic azaheterocycles, such as N1-methylnicotinamide and N-methylphthalazinium, or aldehydes, such as benzaldehyde, retinal, and vanillin. In the past decade, AOX has been recognized increasingly to play an important role in the metabolism of drugs through its complex cofactor content, tissue distribution, and substrate recognition. In humans, only one AOX gene (AOX1) is present, but in mouse and other mammals different AOX homologs were identified. The multiple AOX isoforms are expressed tissue-specifically in different organisms, and it is believed that they recognize distinct substrates and carry out different physiological tasks. AOX is a dimer with a molecular mass of approximately 300 kDa, and each subunit of the homodimeric enzyme contains four different cofactors: the molybdenum cofactor, two distinct [2Fe-2S] clusters, and one FAD. We purified the AOX homolog from mouse liver (mAOX3) and established a system for the heterologous expression of mAOX3 in Escherichia coli. The purified enzymes were compared. Both proteins show the same characteristics and catalytic properties, with the difference that the recombinant protein was expressed and purified in a 30% active form, whereas the native protein is 100% active. Spectroscopic characterization showed that FeSII is not assembled completely in mAOX3. In addition, both proteins were crystallized. The best crystals were from native mAOX3 and diffracted beyond 2.9 Å. The crystals belong to space group P1, and two dimers are present in the unit cell. Aldehyde oxidase (AOX) is a complex molybdoflavoprotein that belongs to a family of structurally related molybdoenzymes that bind the molybdenum cofactor (Moco) (Hille, 1996). AOX is homologous to xanthine oxidoreductase (XOR), another mammalian molybdoflavoenzyme, and both AOX and XOR show a remarkable degree of sequence similarity (Krenitsky, 1978; Garattini et al., 2003). AOX is active as a homodimer, and each 150-kDa monomer consists of three separate domains that bind different cofactors: the 20-kDa N-terminal domain binds two distinct [2Fe-2S] clusters, the 40-kDa central domain binds the FAD cofactor, and the 80-kDa C-terminal domain binds Moco (Garattini et al., 2008). Moco-containing enzymes are divided further into three different families, the xanthine oxidase (XO) family, the sulfite oxidase family, and the dimethyl sulfoxide reductase family, which are classified in accordance to the ligands at the molybdenum active site (Hille, 1996). Members of the XOR family are characterized by an equatorial sulfur ligand at the Moco that is essential for enzyme activity (Wahl and Rajagopalan, 1982). Given the similarities in the overall structures and subunit composition of AOX and XOR, the properties of the two enzymes are related closely. Both enzymes are present in the cytosol and are found in all vertebrates (Garattini et al., 2003). However, the primary difference is that XOR can exist in two interconvertible forms, XO and xanthine dehydrogenase (XDH) (Nishino et al., 2008), whereas AOX solely exists in the oxidase form. AOX uses only molecular oxygen as the electron acceptor, in contrast to XOR, which transfers electrons to NAD+ and oxygen in the XDH and XO forms, respectively. It is notable that the substrate and inhibitor specificities of XOR and AOX are different, and, in general, AOX has the ability to oxidize a broader range of substrates than XOR (Krenitsky et al., 1972). Typical substrates for AOX are compounds containing an aldehyde function, nitro/nitroso compounds, or N-heterocycles (Pryde et al., 2010). The biochemical and physiological functions of AOX in humans are still largely obscure. Single monogenic deficits for any AOX have not been described so far in mammalia; however, AOX is not essential for humans because genetic deficiencies in the Moco sulfurase (MCSF) gene are not associated with pathophysiological consequences. The ability of AOX to oxidize N-heterocycles makes it an important enzyme in the metabolism of drugs and xenobiotics (Pryde et al., 2010). In animals, AOX is likely to detoxify exogenously derived nonphysiological compounds of wide structural diversity, and it is believed that the absence of AOX leads to symptoms under unusual circumstances of high intake of such xenobiotics. In humans, only one gene for AOX exists, whereas in mice and other mammals different homologs of AOX were identified (Garattini et al., 2003). Because the identified proteins are highly homologous with the originally known AOX (named AOX1, the first vertebrate AOX identified and characterized), the three related proteins are known currently as AOX3, AOX4, and AOX3L1 (formerly AOH1, AOH2, and AOH3, respectively) (Garattini et al., 2003; Terao et al., 2006; Garattini and Terao, 2011). These multiple AOX isoforms are expressed tissue-specifically in different organisms, but their existence and expression pattern vary in different animal species (Garattini et al., 2003; Terao et al., 2006). It is believed that the various AOX isoforms recognize distinct substrates and carry out different physiological tasks. 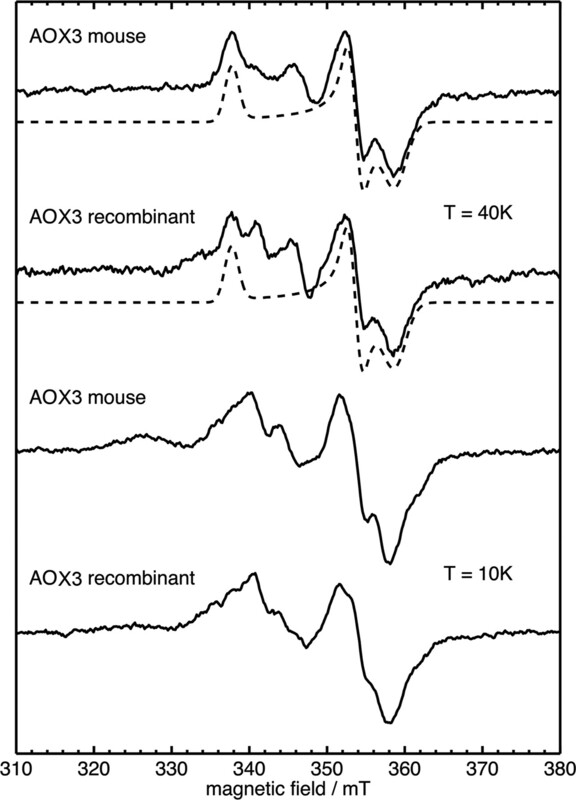 The best studied AOX homologs are the ones identified in mouse. The tissue distribution of mouse AOX3 (mAOX3) is superimposable to that of mAOX1, and the two enzymes are synthesized predominantly in hepatic, lung, and testicular tissues (Vila et al., 2004). Therefore, comparison of the enzymatic properties of mAOX3 and mAOX1 is particularly relevant but so far has been very difficult (Terao et al., 2001). In this study, we established a reproducible system for the expression of mAOX3 in Escherichia coli in a 30% functional form. The recombinant protein was compared in detail with the native protein purified from mouse liver as to its kinetic and spectroscopic properties. It was shown that both proteins had similar properties, although in comparison to mAOX1 the FeSII saturation was lower. The heterologous expression system for mAOX3 provided us with enough material to perform broad crystallization screenings. The vast majority of the crystallization trials were performed using the recombinant protein, and the crystallization conditions obtained were used to reproduce crystals using the native mAOX3 protein purified from mouse livers. We were able to obtain a usable dataset to a resolution of 2.9 Å with native mAOX3 crystals. Bacterial Strains, Plasmids, and Growth Conditions. E. coli TP1000 (ΔmobAB) (Palmer et al., 1996) cells were used for the coexpression of wild-type mAOX3 with mouse MCSF (mMCSF) (pSS110) (Schumann et al., 2009). E. coli expression cultures were grown in Luria-Bertani medium under aerobic conditions at 30°C for 24 h.
The cDNA of mAOX3 was cloned from mouse CD1 liver (Vila et al., 2004) using primers designed to permit cloning into the NdeI and SalI sites of the expression vector pTrcHis (Temple et al., 2000). The resulting plasmid was designated pMMA1 and expresses mAOX3 as an N-terminal fusion protein with a His6 tag. For heterologous expression in E. coli, pMMA1 and pSS110 (Schumann et al., 2009) were transformed into TP1000 cells. To express the recombinant proteins, cells were grown at 30°C in 14 liters of Luria-Bertani medium supplemented with 150 μg/ml ampicillin, 50 μg/ml chloramphenicol, 1 mM molybdate, and 10 M isopropyl β-d-thiogalactoside. After 24 h of expression at 30°C and low aeration, the cells were harvested by centrifugation and resuspended in 50 mM sodium phosphate buffer (pH 8.0) and 300 mM NaCl. To disrupt the cells, a cell disruptor (TS Benchtop Series; Constant Systems, Northamptonshire, UK) was used at 12°C and 1.35 kbar in the presence of DNase I and lysozyme (1 mg/l). The cleared lysate was loaded onto a nickel-nitrilotriacetic acid (Ni-NTA) (QIAGEN, Valencia, CA) column using 0.2 ml of resin per liter of culture. Two washing steps were performed with 35 and 50 mM imidazole, and mAOX3 was eluted with 250 mM imidazole. Buffer was exchanged to 50 mM potassium phosphate (pH 7.8) and 0.1 mM EDTA, using PD10 columns (GE Healthcare, Chalfont St. Giles, Buckinghamshire, UK). To increase the activity of the enzyme, chemical sulfuration was performed under conditions similar to those reported previously (Massey and Edmondson, 1970; Wahl et al., 1982). The purified enzyme was incubated for 1 h with 500 μM sodium dithionite, 25 μM methyl viologen, and 2 mM sodium sulfide in an anaerobic chamber (Coy Lab Systems, Grass Lake, MI). After buffer exchange to 50 mM sodium phosphate (pH 8.0) and 300 mM NaCl, the protein sample was loaded onto a Superose 6 column (GE Healthcare), and fractions containing dimeric mAOX3 were combined and stored in 100 mM potassium phosphate (pH 7.4) at −80°C. To cleave the N-terminal His6 tag, the enzyme was incubated in 50 mM Tris-HCl (pH 8.0) and 1 mM EDTA at 4°C for 12 h. The thrombin cleavage site introduced by pTrcHis was used, and the 17 amino acid sequence containing the His6 tag was cleaved after Arg17 (Temple et al., 2000). The protein was purified afterward by size exclusion chromatography using a HiLoad 26/60 Superdex 200 column (GE Healthcare) equilibrated with 50 mM sodium phosphate (pH 8.0) and 300 mM NaCl. The fractions containing the dimeric His6-mAOX3 were combined and concentrated by ultrafiltration (Amicon 50-kDa molecular weight cut-off; Millipore Corporation, Billerica, MA) to a final concentration of 17.8 mg/ml. Protein aliquots were frozen in liquid nitrogen and stored at −80°C until usage, without loss of activity. Native mAOX3 was purified following the protocol described by Terao et al. (2001). One hundred CD1 mouse livers were homogenized in three volumes of sodium phosphate buffer (pH 7.5) with an Ultra-Turrax (Omni 2000; Omni International, Kennesaw, GA), and the cleared lysate was heated to 55°C for 10 min. After ammonium sulfate precipitation overnight (50% saturation), the pellet was resuspended and subjected to benzamidine Sepharose chromatography (GE Healthcare, Munich, Germany). The protein was purified further using a linear NaCl gradient on a 5/5 FPLC Mono Q column (GE Healthcare). 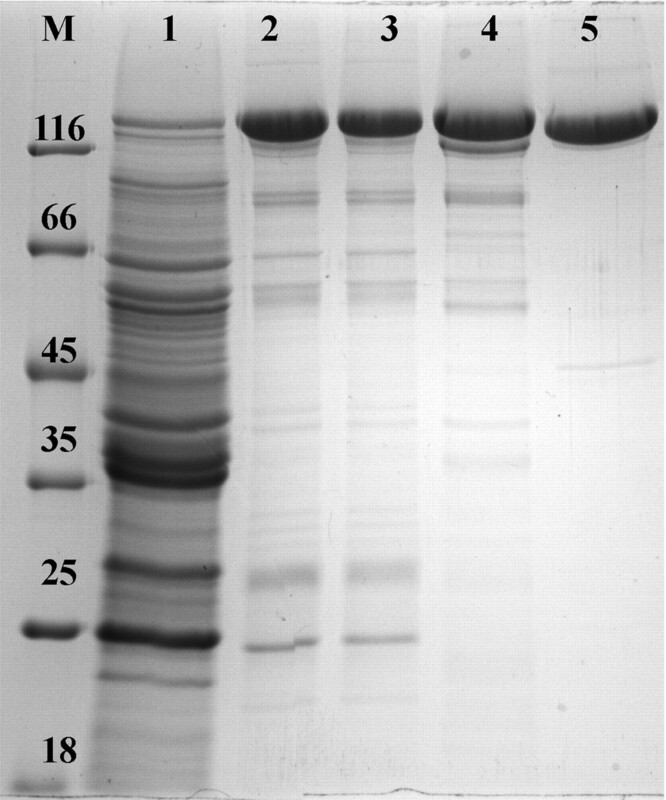 SDS-polyacrylamide gel electrophoresis (PAGE) was performed as described by Laemmli (Laemmli UK, 1970) using 10% polyacrylamide gels. The gels were stained with Coomassie Brilliant Blue R (Sigma, Munich, Germany). The mAOX3 activity was visualized on native polyacrylamide gels by staining with 25 mM benzaldehyde and 1 mM 3-(4,5-dimethylthiazol-2-yl)-2,5-diphenyltetrazolium in 50 mM Tris (pH 8.0) (Pérez-Vicente et al., 1992). Enzyme assays were performed at 37°C in 50 mM Tris-HCl (pH 8.0) and 1 mM EDTA with variable substrate (0–250 μM benzaldehyde, 0–10 mM butyraldehyde, and 0–500 μM 2-OH-pyrimidine) and purified mAOX3 (50–200 nM) concentrations. As electron acceptors, 100 μM 2,6-dichlorophenolindophenol (DCPIP) or 1 mM potassium ferricyanide were used in a final reaction volume of 500 μl. Enzyme activity was monitored at 600 nm for DCPIP and 420 nm for ferricyanide. Specific activity was calculated using the molecular extinction coefficient of 21,400 M−1 cm−1 for mAOX3. Kinetic parameters were obtained by nonlinear fitting of the Michaelis-Menten equation or the substrate inhibition equation using R, build 2.12.00 (R Development Core Team, 2010). Metal Analysis by Inductively Coupled Plasma Mass Spectrometry. The molybdenum and iron contents were determined using inductively coupled plasma mass spectrometry (ICP-MS) (PE SCIEX ELAN6000; PerkinElmer Life and Analytical Sciences, Waltham, MA). Samples of 500 μl containing 5 μM protein were wet-ashed with 32.5% nitric acid at 100°C overnight. Three hundred microliters of the wet-ashed sample was diluted with water into 5 ml, and metal presence was quantified by ICP-MS using a multielement standard solution (XVI; Merck, Darmstadt, Germany) and an internal yttrium standard. FAD Analysis by High-Performance Liquid Chromatography. FAD was determined by the AMP content after the hydrolysis of 20 μM mAOX3 in 5% sulfuric acid for 10 min at 95°C. Released AMP was detected on a C18 reversed-phase column as reported previously (Schmitz et al., 2008) and quantified against a FAD standard. UV/visible circular dichroism (CD) spectra of 8 M enzyme samples were recorded in 50 mM potassium phosphate (pH 7.8) and 0.1 mM EDTA, using a CD spectrophotometer (J-715; Jasco, Tokyo, Japan). The scanning mode was set stepwise, for each nanometer a data pitch was recorded with a response time of 2 s, and each measurement was repeated four times. The 9.5-GHz X-band EPR spectra were recorded on an ESP300E spectrometer (Bruker, Newark, DE) equipped with a TE102 microwave cavity (Bruker, Madison, WI). For temperature control between 5 and 300 K, a helium flow cryostat (ESR 900; Oxford Instruments, Oxfordshire, UK) with a temperature controller (ITC4; Oxford Instruments) was used. The microwave frequency was detected with a frequency counter (EIP Microwave Inc., San Jose, CA). The magnetic field was calibrated using a Li/LiF standard with a known g value of 2.002293 ± 0.000002 (Stesmans and Van Gorp, 1989). Samples (typically 0.1 mM enzyme) were prepared in quartz tubes with an outer diameter of 4 mm. Chemical reduction to generate the reduced Fe(II)/Fe(III) form of the FeS clusters was performed by adding a small volume of anaerobic sodium dithionite solution to the protein solution under a weak stream of argon gas (20-fold excess dithionite with respect to the protein). The sample tubes were frozen in liquid nitrogen after a color change was observed (typically a reaction time of 30 s). Baseline corrections, if required, were performed by subtracting a background spectrum, obtained under the same experimental conditions, from the spectrum of a sample containing only a buffer solution. Simulations of the experimental EPR spectra, based on a spin Hamilton operator approach, were performed with the program EasySpin (Stoll and Schweiger, 2006). Initial crystallization studies were pursued with the purified recombinant mAOX3. Several additives as well as some known mAOX3 inhibitors (e.g., menadione) were tested to optimize the crystals. Ionic liquids (butylmethylimidazolium chloride and 1-butyl-3-methylimidazolium diethyleneglycolmonomethylethersulfate) also were tested as additives, because, in a similar case of crystal optimization, this proved to be a very attractive alternative (Coelho et al., 2010). The best protein needles of recombinant mAOX3 were obtained in the following conditions: 12 to 16% polyethylene glycol 8000, 0.1 M potassium phosphate (pH 7.0), equal amounts of protein (17.8 mg/ml, incubated with fresh dithiothreitol at 4°C for 1 h), and precipitant solutions at 20°C (Fig. 1a). Because His tags usually have little effect on the protein native structure but can have an impact in crystallization (Carson et al., 2007), the recombinant protein His6 tag (with 17 residues) was cleaved. With this protein preparation, crystals also were formed under similar conditions but without significant improvement. Crystals of mAOX3 protein: needles from the recombinant protein (a) and crystals from native mouse liver protein (b). Similar crystallization conditions were tested for mouse liver mAOX3: buffer pH was adjusted to 6.5, protein concentration was decreased to 10 mg/ml, and 2 mM EDTA was added to the crystallization solution. Larger, rectangular crystals (0.40 × 0.15 × 0.05 mm; Fig. 1b) of the native mAOX3 were formed reproducibly. These were the only crystals that allowed collection of a usable diffraction data set. Data Collection, Processing, and Structure Solution. All of the tested crystals were flash-cooled directly in liquid nitrogen, using Paratone oil (Hampton Research, Aliso Viejo, CA) as cryoprotectant. Some of the native mAOX3 crystals diffracted to 6 Å, but after being annealed, diffraction improved dramatically to a resolution beyond 3 Å (Fig. 2). A first data set (mNAT-I) consisting of 180° of data were collected at ID14-1 at the European Synchrotron Radiation Facility (ESRF) (Grenoble, France) (Table 1). The crystal belonged to space group P1, with unit cell dimensions a = 91.07 Å, b = 135.02 Å, c = 147.48 Å, α = 78.27°, β = 77.77°, and γ = 89.96°. The calculated Matthews coefficient was 2.89 Å3 Da−1, corresponding to two dimers in the unit cell with a solvent content of 57.4% (Matthews, 1968). Because the data were very anisotropic and the mosaicity was high, the initial data processing using iMosflm 1.0.4 was incomplete (∼89% complete to 2.9 Å) (Leslie, 1992). The same crystal was measured later at ID23-1 at the ESRF. Although a full 360° of data were collected, only approximately 220° were useable (mNAT-II), because the crystal was very anisotropic. The two data sets were merged to increase the completeness and improve the multiplicity. The resulting data set presents very high precision-indicating merging R factor (as expected) and is only ∼80% complete to 2.9 Å (mNAT), but the overall redundancy improved to ∼3.0. The structure of the mAOX3 will be solved by molecular replacement using BALBES on the mNAT-I data set (Long et al., 2008) in the future. The bovine milk XDH structure (Protein Data Bank code 3BDJ) can be used as a search model (Okamoto et al., 2008), and four monomers were found in the unit cell. Diffraction pattern of the native mAOX3 protein obtained at ID14-1 (A) before (top left quadrant) and after reannealing and at ID23-1 (ESRF) (B). The resolution at the edge is 3.0 Å in both images. Values in parentheses correspond to the highest resolution shell. 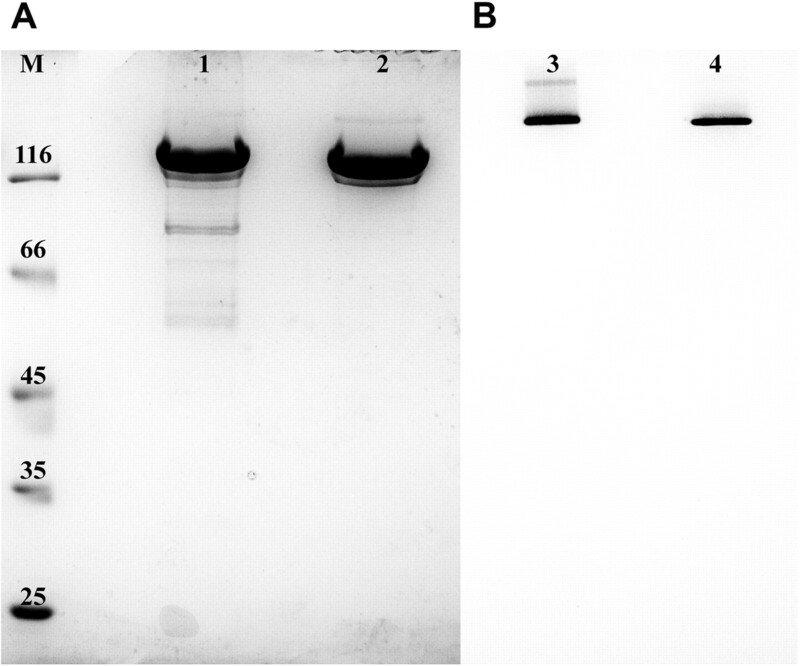 Comparison of Recombinant mAOX3 Expressed in E. coli with the Native Protein Purified from Mouse Livers. Several heterologous expression systems for mammalian AOX have been described. So far, a main drawback of these systems is the low catalytic activity of the purified enzymes due to the low Moco content or reduced content of the terminal Mo=S ligand at the Mo site (Huang et al., 1999; Adachi et al., 2007). In a previous report, we described successful purification of mAOX1 in an active form, after simultaneous expression of mAOX1 and mMCSF in E. coli TP1000 cells (Schumann et al., 2009). This approach ensured a higher level of sulfurated Moco insertion into the enzyme and resulted in a 20% active enzyme that could be purified in a reproducible manner. We adapted this system for the expression of mAOX3. Comparison of the activity of mAOX3 after expression in the presence or absence of mMCSF showed that the content of the terminal sulfur ligand was increased by 19% in the presence of mMCSF (M. Mahro and S. Leimkühler, unpublished observations). Thus, we have used this system for the expression of catalytically active recombinant mAOX3. Recombinant mAOX3 was purified from 14 liters of E. coli culture using sequential Ni-NTA chromatography and size exclusion chromatography. In addition, a chemical sulfuration step was performed to further increase the activity of the enzyme 1.4-fold (Table 2). The purification protocol used for mAOX3 is summarized in Table 2. The overall purification of recombinant mAOX3 from the soluble fraction was more than 35.7-fold with a yield of 2.3%. The total yield was 0.8 mg of pure enzyme per liter of E. coli culture. For comparison, we also purified native mAOX3 from CD1 livers according to the protocol described by Terao et al. (2001). Total protein was quantified with the Bradford assay (Bradford, 1976). The activity was measured by monitoring the decrease in absorption at 600 nm in the presence of 250 μM benzaldehyde and 100 μM DCPIP. Specific enzyme activity is defined as the oxidation of 1 μM benzaldehyde per minute and milligram of enzyme under the assay conditions. SDS-PAGE performed under reducing conditions demonstrated the presence of one major band with a size of 150 kDa for both proteins after purification (Fig. 3). Under these experimental conditions, additional bands of minor intensity with sizes of 130, 80, 70, and 55 kDa that were not present in native mAOX3 were observed for the recombinant protein (Fig. 3). Electrospray mass spectrometry analysis revealed that these bands were degradation products of mAOX3 (data not shown). These degradation products were only detected after the incubation of the protein with β-mercaptoethanol. Both proteins were detectable as a single band in native PAGE visualized by activity staining or Coomassie Blue staining (Fig. 4). The recombinant protein has a slightly different migration behavior on polyacrylamide gels due to the presence of the N-terminal His6 tag (2 kDa). Both native and recombinant mAOX3 eluted from size exclusion chromatography columns mainly at a size of 300 kDa, indicating a functional dimer as the main product of expression and purification (data not shown). 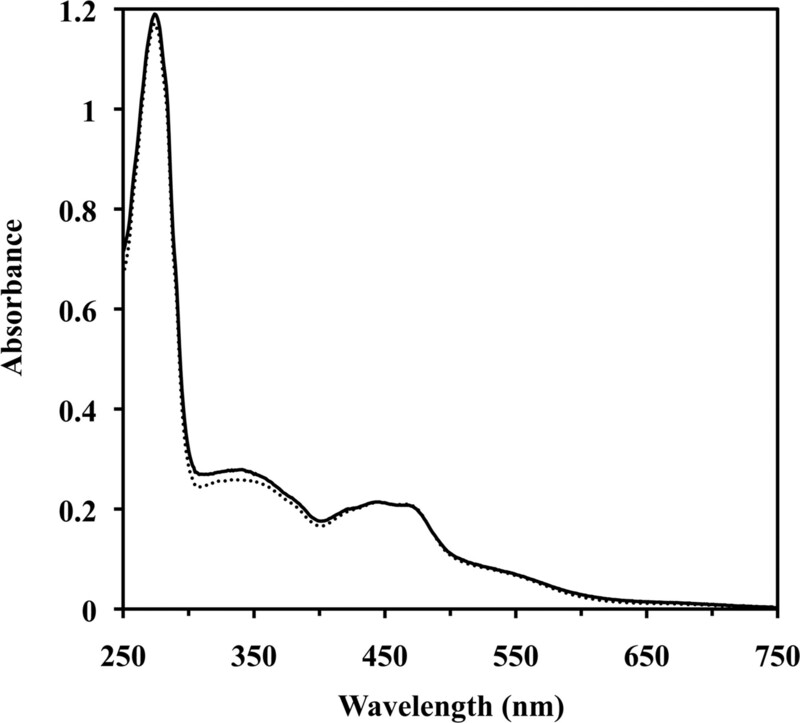 The UV/visible spectra of both proteins are identical and display typical features of molybdoflavoenzymes (Fig. 5). The A280/A444 ratio of 5.2 for the recombinant protein indicates the high purity of the enzyme. The proportion for the native enzyme was similar. The A444/A550 absorbance ratio in the UV/visible spectrum was calculated to be 3.1 for the recombinant enzyme and 3.1 for the native enzyme, demonstrating that both proteins were saturated fully with FAD. In addition, the FAD content of both proteins was determined to be 100% by quantifying the AMP content of the protein. The molybdenum and iron contents were quantified by inductively coupled plasma optical emission spectroscopy (Table 3) and revealed levels for the recombinant mAOX3 of 58.0 ± 0.2% saturation for molybdenum and 57.6 ± 0.3% saturation for iron (with respect to the 2×[2Fe-2S] clusters). For the native mAOX3, the molybdenum saturation was determined to be 103.8 ± 0.2% and the iron saturation was determined to be 53.0 ± 0.6%. Thus, the overall metal content for both proteins is comparable but displays an incomplete saturation for both metals. The cyanolyzable sulfur was determined to be present to 33 ± 0.5% for recombinant mAOX3, whereas the native protein is expected to be fully sulfurated when the activities of the two enzymes are compared (see below). A 12% SDS-PAGE analysis of mAOX3 purification after heterologous expression in E. coli. The protein was purified after Ni-NTA chromatography, a chemical sulfuration step, and Superose 6 chromatography. Purified mAOX1 displays a molecular mass of 150 kDa on SDS-PAGE, and the bands with molecular masses of 130, 80, 70, and 50 kDa correspond to degradation products of recombinant mAOX3, as determined by mass spectrometry. Lane 1, recombinant mAOX3 E. coli crude extract; lane 2, recombinant mAOX3 after Ni-NTA chromatography; lane 3, recombinant mAOX3 after chemical sulfuration; lane 4, recombinant mAOX3 after Superose 6 chromatography; lane 5, native mAOX3. Comparison of recombinant and native mAOX3 by SDS-PAGE and native PAGE. A, purified mAOX3 (2 μg per lane) was analyzed by 10% SDS-PAGE and stained by Coomassie Blue. Bands at molecular masses of 130, 80, 70, and 50 kDa were identified as degradation products by electrospray ionization mass spectrometry analysis. Lane 1, recombinant mAOX3; lane 2, native mAOX3. B, native PAGE of purified mAOX3 (2 μg per lane) was stained by activity staining with 25 mM benzaldehyde and 1 mM 3-(4,5-dimethylthiazol-2-yl)-2,5-diphenyltetrazolium as substrates. Lane 3, recombinant mAOX3; lane 4, native mAOX3. Recombinant mAOX3 has reduced gel mobility due to the N-terminal His6 tag, which increases the molecular mass by approximately 2 kDa. Characterization of native and recombinant mAOX3 by UV/visible absorption spectroscopy. Spectra of air-oxidized recombinant mAOX3 (solid line) and native mAOX3 (dotted line) were recorded in 50 mM potassium phosphate (pH 7.4) under aerobic conditions. Recorded spectra were normalized to a concentration of 10 μM. Molybdenum was quantified by ICP-MS, as described under Materials and Methods. Iron was determined by ICP-MS, as described under Materials and Methods. Steady-State Kinetics of mAOX3 with Different Substrates. Apparent kcat and KM values were determined by the rate of K3[Fe(CN)6] reduction at 420 nm and 25°C in 100 mM potassium phosphate buffer (pH 7.4) (Table 4). Initial rates were plotted against substrate concentrations and fitted nonlinearly to the Michaelis-Menten equation. As substrates, benzaldehyde, butyraldehyde, and 2-OH-pyrimidine were used, and the results were found to be similar to literature data (Vila et al., 2004). Kinetic parameters of native and recombinant mAOX3 are in agreement considering that the activity of the recombinant enzyme is only 30% due to the limited saturation of the cyanolyzable sulfur ligand. The values reported in the literature are slightly different, probably due to different experimental conditions. Apparent kinetic parameters were recorded in 100 mM potassium phosphate (pH 7.4) by varying the concentration of substrate in the presence of 1 mM ferricyanide as an electron acceptor. CD spectra of the air-oxidized forms were measured in the region from 250 to 850 nm. The spectra of the recombinant and native mAOX3 were found to be identical (Fig. 6). 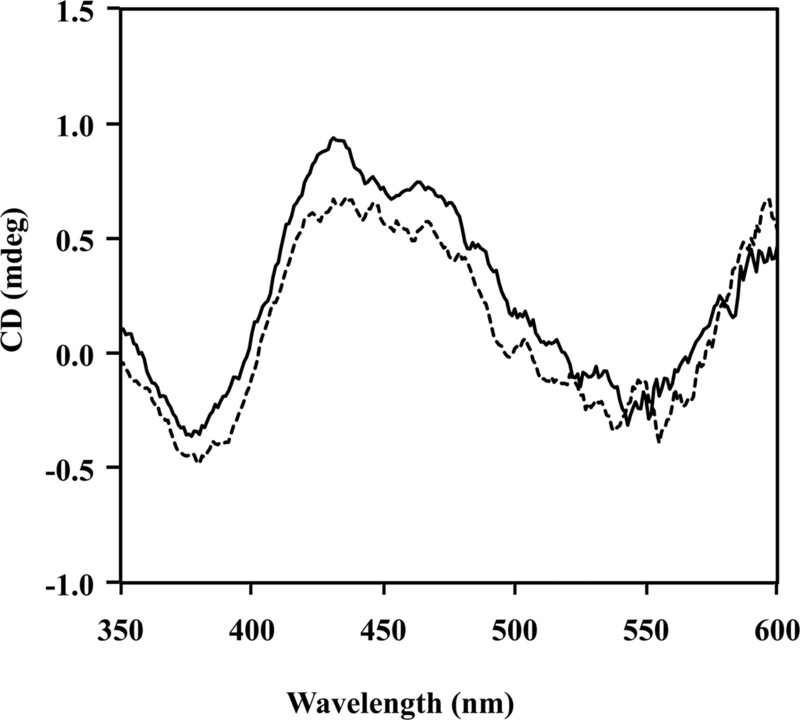 The spectra of the oxidized enzymes exhibited strong negative CD bands at approximately 350 to 400 nm and 520 to 580 nm and intensive positive bands between 400 and 500 nm (Fig. 6). From the various maxima and inflections, transitions can be identified at 380 (−), 432 (+), 474 (+), and 552 (−) nm. The visible CD spectra of oxidized mAOX3 for the recombinant and the native protein are similar. There are differences in comparison to the CD spectrum obtained for mAOX1 (Schumann et al., 2009), especially in the region around 372 and 434 nm, indicating differences in the structure of FeSII. CD spectra of native and recombinant mAOX3. Spectra recombinant mAOX3 (solid line) and native mAOX3 (dotted line) were recorded in 50 mM potassium phosphate (pH 7.8) and 0.1 mM EDTA at 10°C using a CD spectrometer. The protein concentration was 8 μM. EPR Spectroscopy of the mAOX3 [2Fe-2S] Clusters. Because the purified mAOX3 proteins showed a reduced level of iron, the [2Fe-2S] clusters were characterized by EPR spectroscopy. Figure 7 shows the EPR spectra of native and recombinant dithionite-reduced wild-type mAOX3 with the corresponding simulations. The spectra display signals from several superimposed paramagnetic species, which are usually observed for enzymes of the XO family. However, the most prominent signals are the characteristic EPR signals assigned to the two iron sulfur centers FeSI and FeSII, which are similar for all of the members of the XO family that have been described to date (Hille, 1996; Parschat et al., 2001). FeSI has EPR properties showing a rhombic g tensor similar to those of many other [2Fe-2S] proteins, being fully developed at relatively high temperatures (up to T = 80 K), whereas FeSII has unusual EPR properties for [2Fe-2S] species with a strongly rhombic g tensor, showing broad lines that can only be observed clearly at much lower temperatures (T < 40 K). The g values and line widths were evaluated by simulating the spectra using the program EasySpin (Stoll and Schweiger, 2006). In both proteins, FeSI has similar EPR properties, including the typical, rhombic g tensor as observed for the other [2Fe-2S] of the ferredoxin type (Table 5). The spectra indicate heterogeneities of FeSI, which can be seen especially for the gx components. FeSII shows only weak signals in both mAOX3 preparations at lower temperatures, indicating incomplete saturation of FeSII for both recombinant and native mAOX3. However, native mAOX3 displays a slightly higher amount of FeSII. Under the experimental conditions to reduce the proteins, no clear signals of the reduced flavin semiquinone (FAD) or Moco (MoV) were observed. The line widths and positions of the FeS signals at lower temperatures were affected by magnetic interactions. Due to the additional heterogeneities present in the samples, a reliable simulation of FeSII to determine the exact level of FeSII saturation in the enzymes was not possible. Therefore, we report only the g values for FeSI. The obtained g tensor and line width for FeSI of mAOX3 are almost identical to the values previously published for mAOX1 (Schumann et al., 2009), indicating the high structural similarity of the proteins as expected from the amino acid sequence identity of 61%. EPR spectra of native and recombinant mAOX3. The figure shows the dithionite-reduced native mAOX3 (top spectrum) and recombinant mAOX3 (bottom spectrum) at temperatures of 40 and 10 K with the corresponding simulations (dashed traces). In both proteins, FeSI has similar EPR properties, showing a rhombic g tensor as observed for other [2Fe-2S] ferredoxins. FeSII shows only weak signals in mAOX3 at 10 K, whereas a slightly higher amount of FeSII is observed in native mAOX3. The g strain was included in the simulation with 0.04 for gx. The g strain was included in the simulation with 0.01 for gz. Numbers in parentheses are estimated error of g values. Protein Crystallization, Data Collection, and Structure Solution. Expression and purification of recombinant mAOX3 was crucial for the crystallization and structure determination of the native protein. The vast majority of the crystallization trials were performed using the recombinant protein (Fig. 1A), overcoming the restrictions imposed by the limited amount of the native mouse protein available. Thus, it was possible to identify suitable crystallization conditions, which were applied successfully to the native protein purified from the mouse liver (Fig. 1B). In spite of the very difficult handling of the crystals and the fact that most of the crystals tested for diffraction did not yield measurable data, we were able to obtain a usable data set with a resolution of 2.9 Å at ID14-1 and ID23-1 at the ESRF (Fig. 2). With these data, the structure of mAOX3 can be solved by molecular replacement methods in the future using homologous XOR as a search model. The present work constitutes a major achievement because it will help to obtain the first crystal structure of AOX, an enzyme of well known importance in drug metabolism and therefore of increasing importance in recent drug design programs (Pryde et al., 2010). Furthermore, the crystal structure of mAOX3 will allow us to explain and understand the mechanistic and substrate specificity differences observed between AOX and XOR despite their remarkable similarity. We have reported a system for heterologous expression of mAOX3 in E. coli. To ensure a higher sulfuration level of mAOX3, we engineered E. coli for simultaneous expression of the mMCSF and mAOX3 proteins, as reported previously for mAOX1 (Schumann et al., 2009). After coexpression with mMCSF and chemical sulfuration, 30% of mAOX3 exists in the catalytically active form. The recombinant mAOX3 displays similar catalytic properties in comparison to those of the enzyme purified from mouse livers. This finding demonstrates that the protein was folded correctly in mMCSF-engineered E. coli cells and could be used for more detailed analyses. The recombinant enzyme displayed only 30% of the activity with benzaldehyde, butyraldehyde, or 2-OH-pyrimidine as substrates in comparison to that of the native enzyme, values that are consistent with its sulfuration level. Both recombinant and native mAOX3 were compared in detail on the basis of their spectroscopic properties. The EPR spectra of mAOX3 were found to be very similar to those from the mAOX1 protein, showing a rhombic signal for FeSI (Schumann et al., 2008). There are essentially no differences in the g values and line widths for the native and the recombinant enzymes. However, in particular, the FeSII center was not saturated fully in both enzymes, a finding that is consistent with the iron saturation of both enzymes. Because FeSII is the more surface exposed FeS cluster of the two, as revealed by the crystal structure of bovine XO/XDH, it might be possible that the cluster is partially lost during the purification of the enzymes. At least, the lower saturation of FeSII is not based on the inability of the E. coli system to insert the cluster correctly, because both enzymes display almost identical EPR spectra. Overall, the close similarity of the EPR parameters indicated the presence of the same ligands and similar geometries of the two redox centers in comparison to those of mAOX1. The recombinant enzyme was used to optimize the crystallization conditions for the native enzyme. We were able to obtain a usable data set at a resolution of 2.9 Å with crystals of native mAOX3. This is a major achievement for the characterization of AOX, an enzyme of well known importance in drug metabolism, and therefore of increasing importance in recent drug design programs. In addition, the established expression system for mAOX3 in E. coli can be used further for detailed site-directed mutagenesis and structure-function studies of this enzyme. Participated in research design: Mahro, Coelho, Trincão, Rodriguez, Garattini, Lendzian, Romão, and Leimkühler. Conducted experiments: Mahro, Coelho, Trincão, Rodriguez, Terao, and Saggu. Contributed new reagents or analytic tools: Coelho. Performed data analysis: Mahro, Coelho, Trincão, Saggu, Lendzian, and Leimkühler. Wrote or contributed to the writing of the manuscript: Mahro, Coelho, Trincão, Garattini, Saggu, Lendzian, Hildebrandt, Romão, and Leimkühler. We thank Manfred Nimtz (Helmholtz Center for Infection Research, Braunschweig, Germany) for matrix-assisted laser desorption ionization peptide mapping and the ID 14-1 ID23-2 staff at the ESRF for assistance during data collection. This work was supported by the Cluster of Excellence “Unifying Concepts in Catalysis” coordinated by the Technische Universität Berlin; and Fundação para a Ciência e Tecnologia, Portugal [Grant SFRH/BD/37948/2007] (to C.C.) and Project [PTDC/QUI/64733/2006]. The exchange of researchers among laboratories involved in the work was funded by the Deutscher Akademischer Austauschdienst Programm-GRICES program. (2007) His-tag impact on structure. Acta Crystallogr D Biol Crystallogr 63:295–301. (2010) The use of ionic liquids as crystallization additives allowed to overcome nanodrop scaling up problems: a success case for producing diffraction-quality crystals of nitrate reductase. J Cryst Growth 312:714–719. (2011) Increasing recognition of the importance of aldehyde oxidase in drug development and discovery. Drug Metab Rev doi:10.3109/03602532.2011.560606. (1999) Molecular cloning of retinal oxidase/aldehyde oxidase cDNAs from rabbit and mouse livers and functional expression of recombinant mouse retinal oxidase cDNA in Escherichia coli. Arch Biochem Biophys 364:264–272. (1978) Aldehyde oxidase and xanthine oxidase–functional and evolutionary relationships. Biochem Pharmacol 27:2763–2764. (1972) A comparison of the specificities of xanthine oxidase and aldehyde oxidase. Arch Biochem Biophys 150:585–599. (1970) Cleavage of structural proteins during the assembly of the head of phage T4. Nature 227:680–685. (1992) Recent changes to the MOSFLM package for processing film and image plate data. Joint CCP4*ESF-EAMCB Newsletter on Protein Crystallography 26. (2008) BALBES: a molecular-replacement pipeline. Acta Crystallogr D Biol Crystallogr 64:125–132. (1968) Solvent content of protein crystals. J Mol Biol 33:491–497. (2008) Mammalian xanthine oxidoreductase - mechanism of transition from xanthine dehydrogenase to xanthine oxidase. FEBS J 275:3278–3289. (2008) Mechanism of inhibition of xanthine oxidoreductase by allopurinol: crystal structure of reduced bovine milk xanthine oxidoreductase bound with oxipurinol. Nucleosides Nucleotides Nucleic Acids 27:888–893. (1992) Purification and substrate inactivation of xanthine dehydrogenase from Chlamydomonas reinhardtii. Biochim Biophys Acta 1117:159–166. R Development Core Team (2010) R: A Language and Environment for Statistical Computing, R Foundation for Statistical Computing, Vienna, Austria. (2008) The sulfurtransferase activity of Uba4 presents a link between ubiquitin-like protein conjugation and activation of sulfur carrier proteins. Biochemistry 47:6479–6489. (1989) Novel method for accurate g measurements in electron-spin resonance. Rev Sci Instrum 60:2949–2952.
. (2001) Purification of the aldehyde oxidase homolog 1 (AOH1) protein and cloning of the AOH1 and aldehyde oxidase homolog 2 (AOH2) genes. Identification of a novel molybdo-flavoprotein gene cluster on mouse chromosome 1. J Biol Chem 276:46347–46363. (1982) Drosophila melanogaster ma-l mutants are defective in the sulfuration of desulfo Mo hydroxylases. J Biol Chem 257:3958–3962.